Great books come with titles. When this book is been read and reviewed to be interesting, we say, “Great books come with GREAT titles.” I don’t know if that’s often true because we get taken away with how interesting the book is that we consciously (or unconsciously) hail the title. i’d be like, “Dude, have you read it, it’s an Amazing book.” During such conversations, i often passe the name around because i love the book. If you love a book, you love the title. But then, again, this is usually not true in a few cases, some cover designs are a bit elusive and indelicate. Readers would not want to open (click on) your book because its font or title is “not cool.” Learn it. Apart from the book talk, a blog or book blog should have a good header-image. It could be on the right, center or the traditional left. A good banner (header-image) makes visitors remember the name/title of your blog and you could exchange your banner with other sites for traffic (more visitors). While checking out Kabenlah’s Blog i stumbled up a website you could make a banner for free. 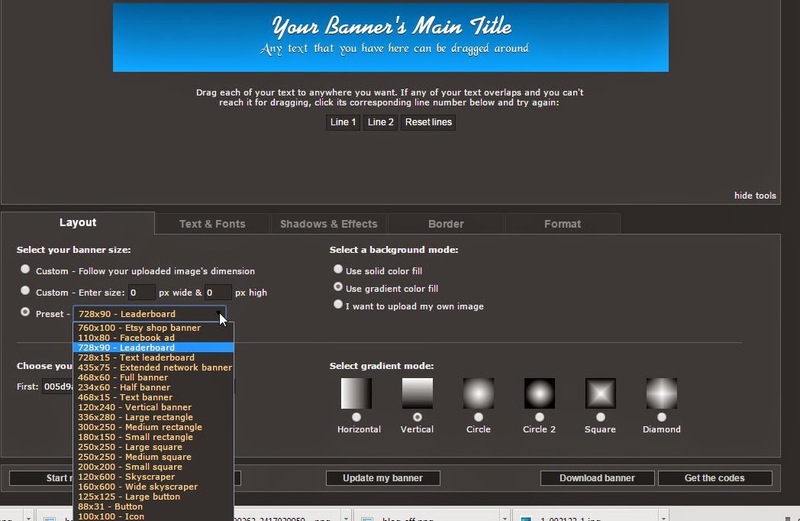 The site’s name is bannerfans.com and you can make as many as you want for free. The signup is optional but it’s advisable to join, who knows what lies beyond the front page? The site is equipped with image customization of all kind and formats. You could make all kinds of banner (see image above) and exchange with blogs or website that you’d like to advertise with. What else? well, you could get the codes of the image for your blog or forum or simply download it straight to your device, all for no cost. You should get one.